Offering Hot Deals on products, such as shampoo & conditioner, throughout the store each month! 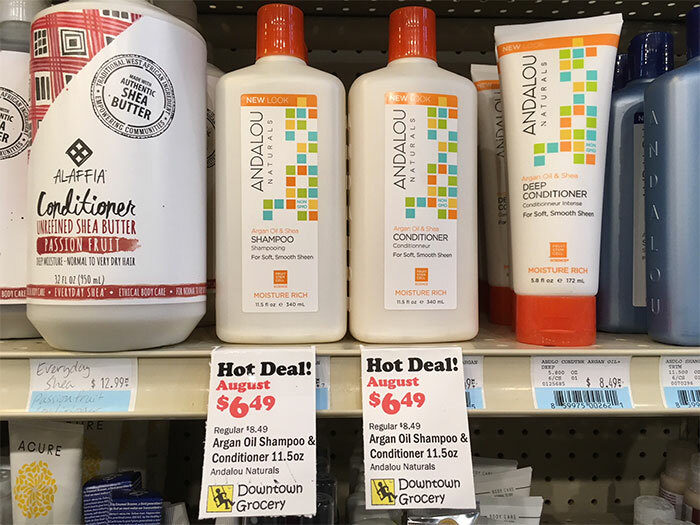 Offering Hot Deals on products, such as shampoo & conditioner, throughout the store each month! Save every day on your family budget! Take advantage of our Monthly Hot Deals, New Item Sales, Case-to-Go Program (save 10% on preorders of full cases of any item we can find), Six-Pack Mix & Match (save 10% on any six beers or ciders), and give Gift Certificates (colorful paper gift certificates) to let your family & friends save, too! Everyday savings at Downtown Grocery!